Rama! You are the most virtuous of all! Rama! You are the delight of our hearts! Sita’s Rama! Your face is like the moon! You are deeply dark ! Your clothes are golden! You are the cessation of enemies! Happy Ramanavami to all my readers! How did you celebrate this occasion? I am sadly negligent; my festival days go by simply, with just a mental marking, an acknowledgement when I say my prayers. Is that enough? Should that not be enough? I feel a twinge of guilt. I remember my childhood when my family would wear new clothes, go to the temple and then have a lovely feast to eat. Yet I ask – when we mark a festival with a feast, is it God we please or our own selves ? When we buy and wear new clothes, whom are we trying to please? I guess you know what I think! Yet, these ways of marking festivals have an important part to play. In my childhood, because my parents bought me new clothes only for festival days, I didn’t even realise one could buy clothes for no reason! In a way, it made each garment I wore a kind of ‘prasAda’, a blessing from above. Now that my clothes are bought whenever I please, they have lost their specialness. Likewise, my mother prepared certain dishes only on certain feast days. The dishes somehow became enhanced by that. They became ‘prasAda’, a gift from God. By marking these feasts, we silently thank God for all that we have. I have prepared no feast today. Instead, the prasAda that I prepare today is this post. One of my very favourite songs, it is very simply a list of ‘identifiers’ for Lord Rama. Nothing is asked, not even blessings. An acknowledgement, that is all it is. It is written in Sanskrit by Swathi Thirunal and set to raga Simhendra Madhyamam. To know more about this raga, click here. I am especially fond of Sikkil Gurucharan’s rendition in his CD December Season 2005. It is available in Musicindiaonline; click here for the Alapana and here for the Kriti. In fact, I recommend that you buy this track from whichever online store you use, keep it on your mp3 player and listen very often! In the meanwhile, I found a rendition from this exceptionally talented young man in youtube, which I present to you here. Note the superbly talented S.Varadarajan on the violin; I really admire this young man! Another young artist, Nisha Rajagopal, has also given a find rendition which I enjoyed very much. Listen below, Alapana from 16:25 and Kriti from 23:42. Note: This kriti has three charanams but I have heard only the third one sung. Therefore only that charanam is transcribed here. Also note that the singers usually use the long A at the end of musical phrases. eg. dhAma is often sung as dhAmA. Lyrics are verified aurally, but I cannot guarantee correctness. Rama! You are the most virtuous of all! (guNa=virtue, sImA=boundary). Rama! You are the delight (abhirama=delightful) of our hearts (hrdaya)! Sita’s Rama! O my friend (bandhu) of the wretched (dIna)! You are the destroyer (vidalana=tear asunder) of the humbled (vinata) Ravana (dasha mukha=ten faced)! You are like a wish-fulfilling tree (kalpataru)! You have a lotus-navel (vArija nAbha) (also signature of Swati Thirunal)! You dwell in (dhAma) in the minds (mAnasa) of sages (muni)! You have a kasturi tilaka (su lalAma=beautiful mark on your forehead, mrga mada=deer musk)! Sita (vaidEhi), who is born from the earth (avani ja), looks at you, the one who gives bountifully (sudAma) with sidelong glaces (apAnga) filled with love (sakAma). Oh Ananadavalli! Grant me happiness eternally! Your beautiful smile eradiates the darkness of suffering of poor people like a ray of nectar. The beautiful one who holds a young parrot. Hail! Having flown 16,500 kms traversing 10 time zones over 30 odd hours to travel from one home to another, sleep (or lack thereof) is on my mind. Naturally, I choose to listen today to Raga Nilambari, a soothing and soporific raga most often associated with lullabys in Carnatic music. Today’s song however is not a lullaby; its a prayer song to the Goddess Anandavalli of Padmanabhapuram, Tamil Nadu. Composed by Swathi Thirunal, its slow and soothing sound is a balm to my sleep-disturbed state. 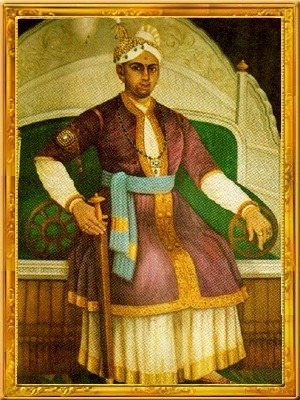 Swathi Thirunal Rama Varma (1813-1846) was the Maharaja of Travancore. A connoisseur of both Carnatic and Hindustani music, he was a prolific composer with some 350+ compositions attributed to him. A linguist, speaking 8 or so languages, with an interest in literature and arts, his court included many expert musicians and dancers. He was a great devotee of Sri Padmanabha, presiding deity of the royals of Travancore. Click here for further information. The poet begs the beautiful Goddess to grant him eternal happiness. ‘Your smile eradiates the darkness of suffering’ says the poet. For lyrics and translation, see footnote. To know more about the raga Neelambari, click here. Though lovely, this song is rarely sung in concerts. I have listened only to this one version by Sanjay Subrahmanyan . Oh Ananadavalli! Grant me happiness eternally! Your beautiful smile eradiates the darkness of suffering of poor people like a ray of nectar. The beautiful one who holds a young parrot. Hail! One whose feet are worshipped by Indra, foe of Jambha, daughter of the king of mountains. One who is adorned with camphor on the crescent like forehead. You are like the bee to the lotus face of Shiva. The one with lotus-like eyes. Always dwell in my heart. Your long tresses surpasses the water bearing collection of clouds. You are the only skillful one in dispelling the misfortunes of those who worship your lotus feet. One who has the glory of removing the afflictions of the three worlds. Please grant me insurmountable prosperity. One who has the most beautiful face like the charming autumnal moon; resides in the hearts of ascetics. One who has charming teeth like the beautiful jasmine buds; feet like the tender leaf of Parijata. 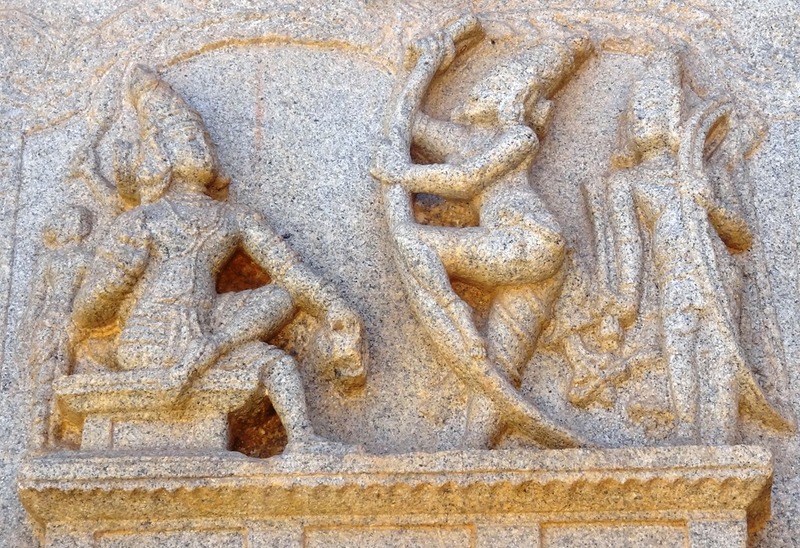 Oh The sister of Lord Padmanabha! Dispel my grief!